For the Hall of it...: When did I become such a hippie? Since Sawyer was born, however, I've become very concerned about the toxicity of cleaning products that I use. Now that he will be crawling soon and everything goes in his mouth, I don't want him getting all these chemicals that I can't pronounce into his cute little body. When I clean the kitchen and bathrooms, I used to mop with Pine-Sol. I found my house smelled like Pine-Sol for a good day or two and it was kind of annoying. I found a "recipe" on Pinterest for a home made floor cleaner recipe using baking soda, vinegar and Dawn dish soap. I tried it and found it works surprisingly well! 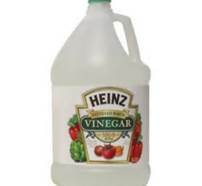 I did a little more research and found that vinegar is a natural anti-bacterial agent that can get rid of bacteria, mold and mildew. 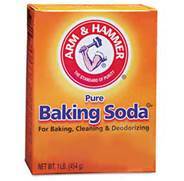 Baking soda helps with cleaning and odors too. Check out www.vinegartips.com for more tips. The best part? Its super cheap! You can buy a gallon of vinegar for less than $2 and a big things of baking soda for about the same price. Its enough product for several months of cleaning! So far I've mainly used vinegar and baking soda in the kitchen but plan to expand my use to the carpets, dog bed, and windows. I also recently ordered some products from The Honest Company. If you haven't heard of The Honest Company, its co-founder is Jessica Alba. The company makes a product line of baby, beauty and cleaning products that are non toxic and environmentally friendly. Plus they are passionate about social responsibility by donating to a charitable children's organization. I got a sample of their Shampoo and Body Wash in my Citrus Lane box last month. I have been using it with Sawyer and not only does it smell delicious (orange vanilla) but it makes his hair so soft! I got a coupon for 20% off my first order so I ordered a sample pack with healing balm, body lotion, all purpose cleaner, laundry detergent, and dishwashing soap. It arrived in 2 days and has the cutest design. I'm a sucker for most things teal anyway. Most of the cleaning products have a pleasant grape fruit scent and work really well! The laundry detergent isn't a big container but with the HE machine you use so little, it will easily last a couple of months. Sawyer had a little skin irritation on his chin the other day and I put some healing balm on him at night and by morning it was gone. Needless to say, The Honest Company has a new customer! I've ordered their bathroom cleaner in my next order as well as hand sanitizer, sunscreen, and hand soap. The bathroom is one of those places where generally I don't care if I have to use a gas mask, I'm all about killing germs. I refuse to use wash cloths or sponges. I use bleach cleaner and paper towels because I don't want to even think about what is on those things after they have cleaned an entire bathroom. Yuck. But I've heard good things about the Honest Company cleaner so I guess we'll see. So, I guess I've become a little bit of a hippie now. I'm not going to go too crazy - you won't see me using cloth diapers or buying Birkenstocks anytime soon but I am making an effort to not expose my son to all the chemicals prevalent in our world today. *please note that the opinions in this post are strictly my own and I was not compensated in any way. I simply like The Honest Company and its products (as well as baking soda and vinegar). Interesting!! I may have to try the vinegar concoction! The "recipe" is 1/2 c baking soda, 1/2 cup vinegar and 2 Tbsp Dawn dish soap in 2 gallons of hot water. I don't really measure, I just eye ball it.